I never thought I’d do this, or even say it–but I think I’m going to have to convert the drivetrain on the Albatross to something with, um…gears. Why this drifting toward the darker side of the street, you ask? Well…. It’s spring, and there are gravel events coming up. Most of them are hilly. In the last 6 weeks or so, I’ve not been entirely well, and treatment is ongoing. The unwellness does not prevent me from riding, but it does prevent me from doing certain kinds of riding–in particular, the kind of high-intensity intervals one gets when climbing one steep hill after another on a single-speed 29er. Some of this is just lost fitness, to be sure. But it’s also become painfully (or more precisely, discomfortly) clear that doing things like climbing hard out of the saddle, sometimes at least, aggravates the existing condition. At first, I considered just shifting my gravel-related riding over to another frame, but that’s just not going to fly. 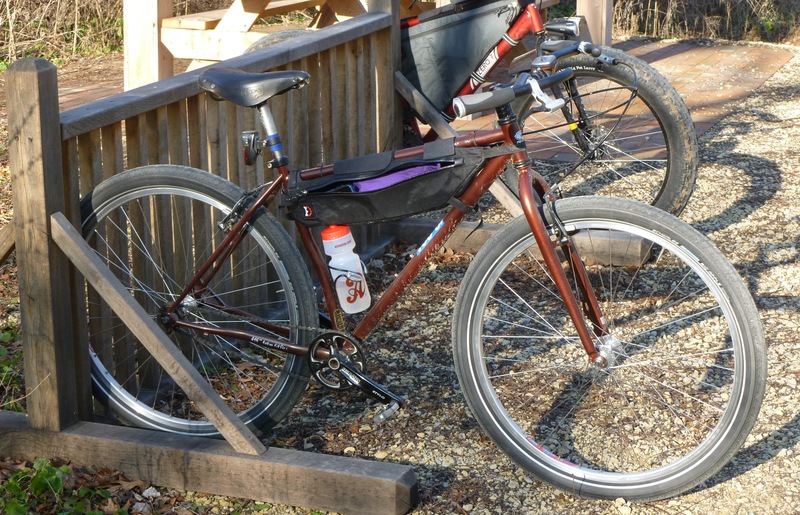 I rode the Albatross in last year’s aborted Almanzo 100–and liked it (despite certain faults). Now that it’s been christened–impregnated, more like–by all that fine limestone dust, it just is the gravel bike. And, a certain bloodymindedness makes me want to take it back to the Almanzo this year, and flog it all the way around the course. So, a 1×8 drivetrain is in its future. That should be plenty, especially if I run a 38t x 12-28 cassette, or something like that. And there’s no reason to mess around with unneeded extra bits like a front derailleur. Come on in… the water’s fine. Especially the 38 x 1×8 part. It does mean, Michael, that I may want to keep that 8spd cassette I promised you — though I think I have two.